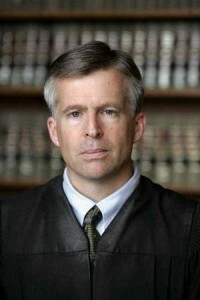 DETROIT – Lawyers for striking Detroit water and sewerage workers have gone into overdrive to overturn a “temporary restraining order” against the work stoppage, issued by U.S. District Court Judge Sean Cox at 8:45 a.m. today. 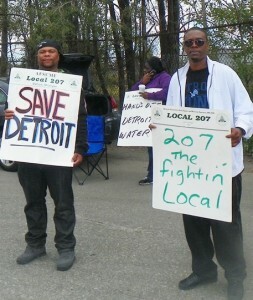 Meanwhile, picket lines at the Wastewater Treatment Plant this afternoon remained strong, with members of Local 207 of the American Federation of State, County and Municipal Employees (AFSCME) determined to stay out. 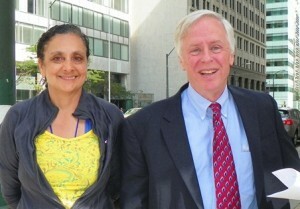 Local 207’s attorneys Shanta Driver and George Washington during press conference Oct. 1, 2012. Attorneys Shanta Driver and George Washington said during a press conference at noon that Cox has no authority as a federal judge to issue such an order. They are asking him to dissolve the order and recuse himself. They are also filing for a “writ of mandamus” with the U.S. Sixth Circuit Court of Appeals which would order him to do so. The Sixth Circuit is already scheduled to hear a multi-union appeal of Cox’s Nov. 4, 2011 order, which unilaterally laid out employment terms for DWSD workers, on Oct. 9, 2012 at 9 a.m. in Cincinnati. 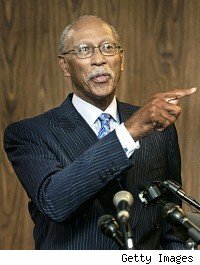 Cox earlier denied motions by AFSCME, the United Auto Workers (UAW), and the International Union of Operating Engineers (IUOE) to intervene in United States of America v. the City of Detroit, Case #77-71100. It does not say how Cox plans to force the workers back on the job. Cox also cites threats to public health and safety, although Local 207 President John Riehl said his members struck the Wastewater Treatment Plant instead of drinking water facilities to prevent such problems. The City claimed in its motion that the work stoppage at the WWTP threatens to increase pollution in the Detroit River, but Driver said reduction of the DWSD workforce by 81 percent presents a greater threat to the environment. The City of Detroit’s motion for a restraining order includes as attachments the flier Local 207 published calling for community support, another informational local flier listing management’s demands, and an unrelated flier from the grass-roots “Retirees Action Movement.” The last was passed out at a Detroit General Retirement System (DGRS). It calls on city retirees to fight attempts to restructure their pension boards. 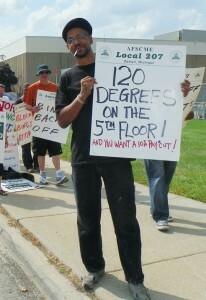 Worker during contract protest at DWSD Huber facility Aug.15,2012. Riehl, who is also an elected DGRS trustee, said at that meeting that he had not seen the flier and did not know who put it out. Washington said he is outraged. 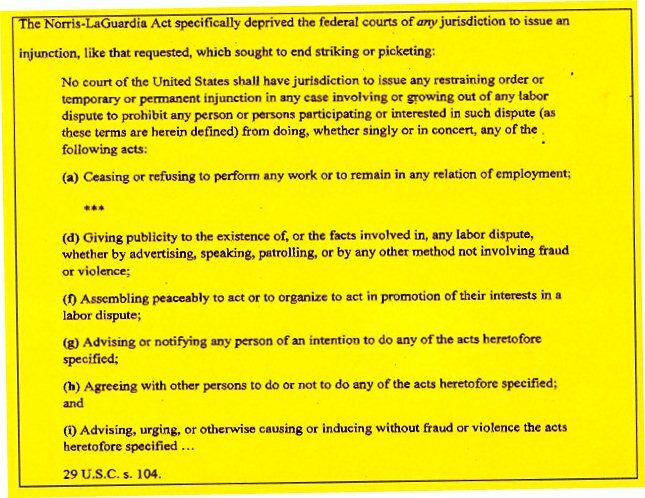 Local 207’s motion to dissolve the order says Cox as a federal judge has no authority to ban any strike or work stoppage, under terms of the federal Norris-LaGuardia Act as well as other federal legislation. Cox has set a hearing on the TRO for Oct. 11, 2012, under federal court rules which mandate that such a hearing must be held within 10 days. Washington said the unions involved in the Sixth Circuit Court appeal are planning to bring supporters with them for that hearing Oct. 9. Those who are interested in attending can call 313-468-3398.